Simple ingredients, extremely versatile, and so addicting – that’s this Red Thai Curry Sauce. The Sauce To End All Sauces. How To Crave Vegetables 24/7. Deliciously Spicy Stuff. But Not Spicy-spicy. But Spicy. Curry Paste Makes the World Go Round. And that pretty much sums up my feelings for this sauce in ten bullet points. Do you remember when I talked about going to ShopHouse in Washington, D.C.? And how great it was that we could build our own Southeast Asian bowls full of crispy freshness and bold flavors and incredible sauces? Is it too obvious that I am kind of trying to be them with the build your own bowl concept and a delicious curry sauce? Only difference being that I am setting up my Southeast Asian bowl extravaganza in my tiny Minnesota kitchen, where I reach my fingertips for the window longingly dreaming of the sun, and notice that oh yes, indeed, the windows now have a full layer of frost on the in-side-of-the-house. And I almost was about to say that I was craving the heat of the Philippines, but then I started getting flashbacks (or hot flashes? hot flashbacks?) reminding me of the feeling of a slow, painful death by tropical sun. Some of you are like: GIMME NOW. And some of you have experienced the too-hot tropical phenomenon and you’re like: FROST IS NICE. This mind-blowing sauce was inspired by a recent take-out adventure to one of my favorite Thai restaurants in St. Paul –> called Pad Thai, located on Grand Avenue, for the next time you feel like visiting SiberiaMinnesota. They have this dish called Pra Ram Long Song that I first met and fell in love with when I was in college. Whiiich is starting to become one of those things you mention and it seems like it was two minutes ago, but then you realize it was more like a LONG time ago. What is going on. But ever since college, it has become one of those dishes where I can’t NOT order it. Even though I want to branch out and try something new which I know in my head will also be delicious, I cannot pull myself away from this mesmerizing dish. I think it might be magical food hypnosis spell or something. After completely demolishing a container of this sauce with steamed veggies and that perfect Thai restaurant Jasmine rice, at home, in my pajamas (I LOVE U TAKE-OUT), I attacked Google for the recipe. I found a few helpful websites and watched a few YouTubes. <– favorite way to waste time, er, um, learn. After all that and a few of my own attempts, I have created this Thai Curry Sauce that is making me so happy on so many levels. It is literally the best-tasting and most simple Thai recipe that I’ve ever made. And bonus: you can put it on anything. Chicken, rice, vegetables, noodles, soups, stir frys, and I am going to go there: salads. By adjusting the consistency of the sauce (see the little timing guide? bottom line: just simmer until it’s perfect for you) it can become a creamy curry sauce, a marinade, a soup base, a stir fry sauce, or even a dressing. I now have this recipe memorized. Until death do us part. This simple Thai Curry Sauce is extremely versatile. Serve it with rice, noodles, meat, veggies, or as a base for soups, marinades, and more. Pour the coconut milk into a small saucepan over high heat. When the coconut milk reaches a gentle simmer, add the peanut butter, curry paste, fish sauce, lime juice, brown sugar, and garlic. Whisk and keep on high heat for 15 minutes or until the sauce has reduced and thickened. Add the peanuts and simmer for another 5-10 minutes. When the sauce coats the back of a spoon, add small amounts of broth or water and whisk to adjust consistency depending on how you will use it and how thick you want it. If the sauce separates, just whisk vigorously to smooth it out again. Serve over rice, noodles, chicken, fish, vegetables, or any other way that sounds good to you! Top with crushed peanuts and scallions. More time simmering = thicker, creamier, more flavorful sauce. If you want a thinner sauce, I would simmer for less time and plan to add a bit of additional liquid. I’ve noticed that when I add the crushed peanuts, the consistency really thickens quite a bit, so you could omit the peanut butter and/or peanuts to also adjust to your desired consistency. Last note: I know the fish sauce might take some convincing, but it is fairly easy to find at any grocery store and REALLY WORTH IT. Don’t worry – it does not make the sauce taste like fish; it just makes it saltier and adds lots of deep flavor. Don’t leave it out! Except if you are vegetarian or vegan, then you can try swapping in soy sauce, miso, and/or hoison for the fish sauce. PS. School canceled again today in this frozen desert land. Which reminds me… frozen dessert? Gotta go. How cool! I can’t wait to see your post about it!! This was a wonderful recipe. The curry had excellent flavor. My wife doesn’t like curry but she liked this. The only problem was it wasn’t spicy enough for my family. We like spicy. The only red curry paste I can find in my local stores is Taste of Thai brand and this was my third recipe trying it. I think that brand is just too mild. I used a whole jar (8 TBSP) in a double batch of your recipe and felt it was just mild. We added red pepper flakes and sriracha sauce to spice it up. Thanks for sharing the recipe. Try the red curry paste in any Chinese stores which comes by ” Weichan” – my spelling could be wrong as I do not have any cans left of Red curry paste. It is spicy and I use actually 1/2 of the can if I am cooking for four. It comes in a size of Tuna can at the grocery store…..
Lindsay, you are hilarious. I think my favorite title is “Just try to control yourself.” Because that sounds just about right–this sauce looks amaziiiiing. Like I want to make it and drink it. Is that weird? Nope! I think you’ll understand. 🙂 Pinning! curry in a hurry =) … either way this looks super yummy and not too difficult to make! definitely must try! This looks great! And maybe I’ll try to convince myself to try Pad Thai the next time I’m in the Twin Cities visiting my parents…though it will be difficult to pass up a visit to Cafe Latte! What kind of curry paste do you use? Even here in Maine I can get many kinds (at least 8, off the top of my head)at a local Asian market. Ah, on rereading, I see that the title of this post is Red Thai Curry Sauce, so it must be red curry paste you’re using in the recipe. I was confused because the only mention of Red was in the post title, and the only part of the title that stuck with me was Thai Curry Sauce. We have often used Thai Kitchen red curry paste, and that works great! By the way, you posts don’t seem to format properly on Firefox. I’ve compared several of your posts against several browsers (on Windows) and they look nice except on Firefox where it’s a bit screwy. Any suggestions? Hi Drew! Always helpful to get feedback like that. I use Firefox all the time and don’t notice a problem – can you email me a screen shot of what you’re seeing? That would be super helpful. lindsay at pinchofyum.com. Thanks! Sure. Uh, how do you want me to send it, it’s a rather large file? Just a screen shot of the page? It should be email-able as an attachment. Yes, but to what address do I email it? Sorry to be a pain. I can’t believe I’m admitting this, but I’ve never eaten Thai food! Is this really spicy? I can’t eat really spicy food, but this looks so good! Maybe I could use less curry paste? This looks awesome. My favorite Thai place makes a dish that looks a lot like this. Definitely going to try it. Really love your pictures too. Thank for sharing! The sauce to end all sauces?! YES please! Sooo, I’m going to need you to send some of this on over. I can deal if it’s a little messy. 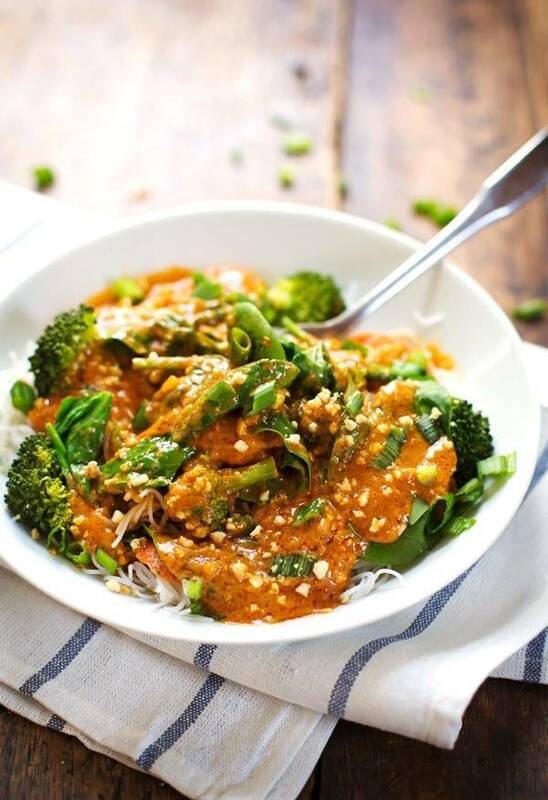 I am a huge fan of red curry paste – love how versatile your sauce is! This looks delicious. I’ve never been able to make thai curry without the paste and I’m starting to think that it is nearly impossible! 🙂 Does anyone know how to make thai curry, truly from scratch? Your alternate title ideas made me laugh out loud, especially “how to crave vegetables all the time.” And hooray for Minnesotans who love Thai food! I’ll be making this one! This plate looks devine! I LOVE peanut butter sauces! Thank you for another delicious recipe! This looks yummy and warm….. maybe I’ll make it tomorrow (since I have no excuse not to!). My favorite Thai restaurant in the area is Ruam Mit Thai, downtown St. Paul near the Children’s Museum. Not a fancy restaurant, but DELICIOUS! Oh good call! I loooove that place. We like the massaman curry there. It sounds like you might put some local Thai places out of business as we’ll all be able to make this delicious sauce at home! I hope to try it soon but have to get the fish sauce. Your added encouragement might push me over the edge of to-buy-or-not-to-buy the next time I see it. Until now I’ve though “ugh” but know it is in many dishes I like at restaurants. maybe it is time to try it at home! Get it for sure! you won’t regret it. It totally gives it that restaurant-like delish factor. You are officially my hero du jour! I love thai food, and the simple ingredients and easy prep of this sauce are just totally fantastic! Can’t wait to try it! Pinning for sure! That looks amazing!!! I’m in South Australia, where the weather today is well over 100, and schools are closed due to the heat and bush fire risk! So we will gladly take some of your cold!!! Will have to save this for a cooler day – we are on a no cook policy in our house at the moment to keep it cool!! Your thai chopped chicken salad and the rainbow salad are on the menu this week!!! Love them both! Thanks Alex! I totally get it and I wish I could bottle up some of this frosty cold and send it your way! Stay cool! OMG – I made this last night! AMAZING!!!! definately adding this to the keep list!!!! Glad you liked it Alex! I LOVE IT TOO! SO MUCH THAT I’M YELLING. I love Thai food so much! I’m definitely making the sauce. Thanks for the helpful photos! Also snow days for a teacher = best thing ever. Lindsay, another wonderful recipe! I will be making this for dinner tonight…although it is 100 degrees here in Melbourne, and in the middle of another heat wave, I will put that air con on and enjoy every mouthful!!! The term Air Con reminds me of the Philippines. 🙂 Enjoy! Curry makes the world go round? Yes!! Seriously, I love, love, love Thai curry. I always have at least two jars of the Thai red curry paste on hand. always! It os on of my favorite ingredients. This sauce is beyond amazing and not to mention gorgeous!